Tom Brady's Stolen Jersey Found With 'Member Of The International Media' : The Two-Way With the same person in Mexico, authorities also recovered another of the New England Patriots quarterback's Super Bowl jerseys, from his team's victory over the Seattle Seahawks in 2015. New England Patriots quarterback Tom Brady celebrates a touchdown against the Atlanta Falcons during Super Bowl 51 in Houston. 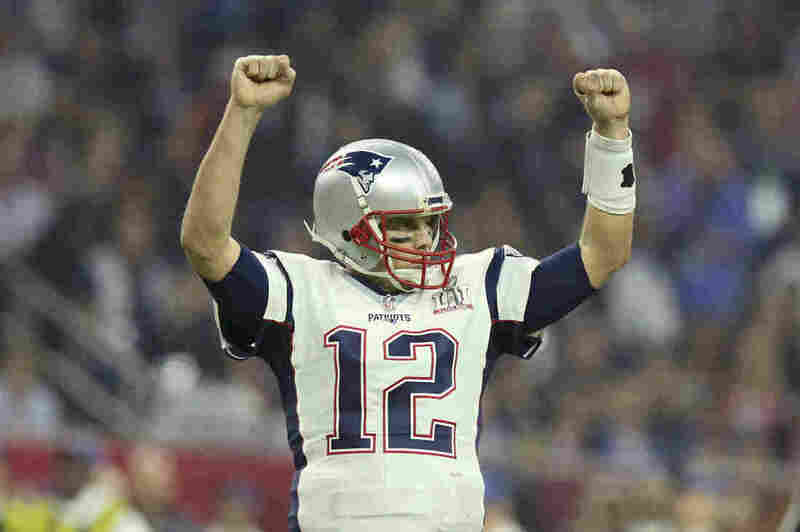 Quarterback Tom Brady led the New England Patriots to one of the greatest comebacks in football history at the Super Bowl this year. Immediately afterward, his game-winning jersey was stolen from the Patriots' locker room in Houston. Now, police say it has been recovered in Mexico. The NFL stated that it was found "in the possession of a credentialed member of the international media." That's not all – with the same person, authorities also recovered another of Brady's Super Bowl jerseys, this one from his team's victory over the Seattle Seahawks in 2015. The NFL said this was a surprise because "it was not previously known that Brady was missing his previous Super Bowl uniform in addition." An informant in Houston led the investigators to Mexico, Houston Police Chief Art Acevedo told reporters, and the FBI and Mexican authorities also took part in the probe. The suspect had legitimate access to the event, and wasn't a ticketholder, he said, adding that he anticipates charges against the alleged perpetrator. Those could include transporting stolen goods across state lines and internationally. "We're highly confident that these are in fact the jerseys, based on our investigative efforts," he said. Investigators are still working to be authenticate the items. Acevedo says that while the investigation was not a top priority for the department, it became a matter of state pride to recover the jersey. "You don't come to Texas and you don't steal when the eyes of the world are upon our state," he said. Brady has estimated that the jersey is worth $500,000, as NPR has reported. He appears visibly annoyed in locker room video captured by Alan Springer of Yahoo Sports. "I absolutely, 100 percent put it in my bag," Brady says despairingly as he searches through his possessions for the lost jersey. "It's unfortunate because that's a nice piece of memorabilia, so if it shows up on eBay somewhere, someone let me know and I'll track that down," he told reporters at a news conference shortly after the game. Last month, Brady jokingly waded into investigating the missing jersey – and put together a "Suspect Board" that included Gollum, Lady Gaga and Jaws. As SB Nation noted, "It did not, however, appear to include anyone posing as a member of the international media."